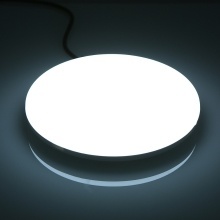 This mini LED ceiling light is minimalist, gorgeous and there is no trouble when it comes to professional illumination of LED, excellent LED chips, long lifespan, no flash and radiation for lighting up your life, perfect for indoor places such as corridor, aisle, stair, dining hall, balcony, living room, etc. Compact, modern and delicate design, be practical as a light but also an attractive decoration for you. High bright low carbon, flicker-free, anti-glare light without strobes and radiation superb LEDs, it illuminates your home with high lumen flux, providing you good illumination, practical and safe. Long lifespan is up to 50,000 hours, eye-protected, cost-efficient and money saving. High transmittance is up to 90%, large irradiation area, high brightness. Low power consumption, environmental friendly. Excellent PVC installation base is safe and endurable, the cords do not distinguish positive wire from negative wire, convenient to operate. Be suitable for indoor places such as corridor, aisle, stair, hallway, balcony, living room, etc. 2. Two power cords do not distinguish positive from negative.